Annette Cordero (right) speaks during the Academic Senate meeting held on Wednesday, Nov. 28, at the Business Communications Center at City College in Santa Barbara, Calif. Cordero is an Assistant Professor at City College and has been affiliated with the college since she graduated high school. 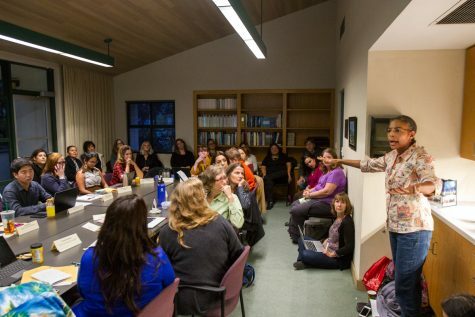 Following an administrator’s use of the n-word at a Gender Equity Workgroup meeting, the Academic Senate held an emotionally charged discussion Wednesday about how to address the issue. Several black students, faculty, staff and members of two “Coalition for Justice” groups spoke to the Board of Trustees Nov. 19 in response to the racial slur. 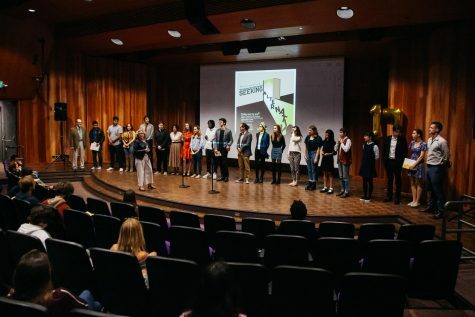 One demand of the coalition groups to the board was for Vice President of Business Services Lyndsay Maas to immediately resign for using the slur and harming black students and faculty. Maas used the un-abbreviated word when she was quoting a student who had used it as hate speech towards a black student. 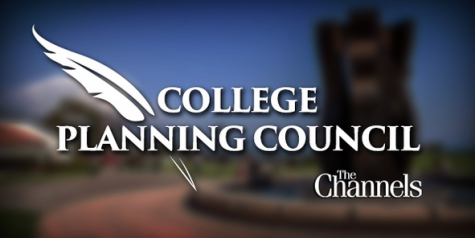 Although Maas is on unpaid leave until Nov. 30 and has committed to taking a number of anti-racist trainings, the college continued to look for ways to further address the issue at Wednesday’s senate meeting. 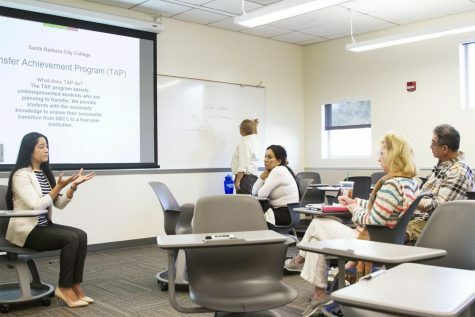 “The college has always felt like home to me, but I have to admit that drastically changed in 2015 after another incident like this one,” said English assistant-professor Annette Cordero. Over twenty people spoke on the issue. All but two voiced that they wanted Maas to resign from the college. 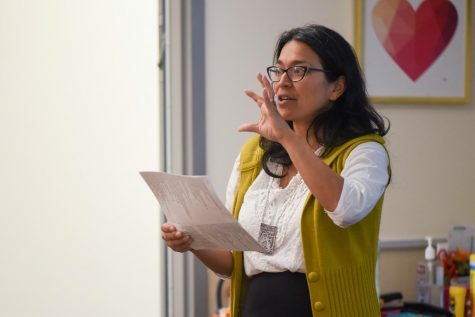 Economics chair Ruth Morales vehemently disagreed with Young and Faculty Association President Cornelia Alsheimer, who also said Maas shouldn’t lose her job. Because Maas walked out of the meeting after multiple people urged her to stay and address the issue, Morales said, Maas failed at her job as an administrator regardless of the context of the word. “For all of those saying that Lyndsay shouldn’t be terminated, this is just more of the same,” she said. “Imagine if that were a black woman talking about Jews. She would have been terminated. And the system would’ve just moved along with her termination or resignation,” she added. Akil Hill, an admissions and records staff member, spoke about the responsibility of college members to check in with those who have been impacted by Maas’ use of the racial slur. “If someone is my colleague or coworker and I care about them and know something derogatory was dropped about them, it is my right that they have on me that I actually speak to them and check in with them,” Hill said. He added that Superintendent-President Anthony Beebe should not have given Lyndsay Maas more of a voice on the issue than the people she impacted by attaching her apology to his campus-wide email on the matter. “The people that she hurt the most have no voice because he gave it to her,” he said. Several people in the room snapped their fingers in support after he spoke, which they did throughout the meeting for anyone who spoke in support of the demands of the Coalition for Justice groups. 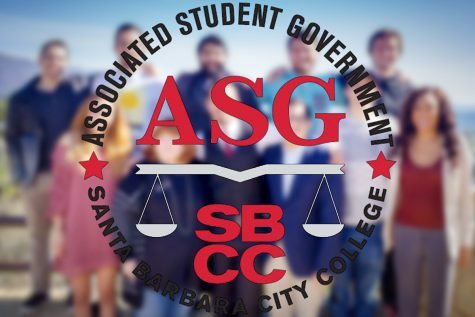 The coalition groups also demanded for there to be an entity independent of the college responsible for reviewing harassment claims and determining the appropriate responses. Several people spoke in support of this, including Hill. Interim Executive Vice President Pamela Ralston, former Senate President Kim Monda, Student Program Advisor Chelsea Lancaster, former Senator Raeanne Napoleon and Librarian Ellen Carey were among those who supported hiring an independent entity. Another demand of the coalitions was for ongoing anti-racism training for members of the Board of Trustees, Deans and all other full and part time members of City College. 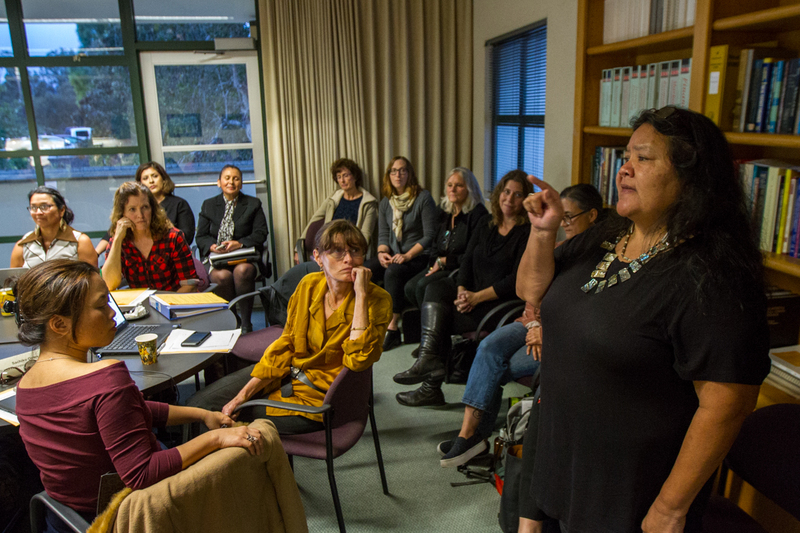 Paige Miller (right), a part-time biology instructor at City College, speaks during the Academic Senate meeting held on Wednesday, Nov. 28, at the Business Communications Center at City College in Santa Barbara, Calif. Miller has taught at City College for 11 years. Paige Miller, a part-time biology instructor at City College who also works at UCSB, said UCSB doesn’t have the same problems because everyone goes through training. “I applied for a full-time position in the biological sciences some years ago, but after talking to my colleagues I realized I don’t ever want to be here full-time,” Miller said, her voice intensifying as she continued. “One of the inherent problems of this institution is that people are not being vetted properly for the position they’re in,” she said. “And then they have not been continued to be trained properly to expand their minds. This story has been changed from a previous version to add a clarification on the context in which the word was used.